The Pan and Zoom window is one of the tools that can be used to navigate around a large diagram. Often the resolution of a diagram must be reduced to ensure it is wholly visible but by using the Pan and Zoom window you can leave the diagram at a readable resolution and pan around to areas of interest zooming in when necessary. Many initiatives will be best described by a number of large diagrams, ranging from A3 - A0. Even when you are fortunate enough to be using a large monitor you will want to change the scale at which you are viewing the diagram and then pan around to find the section or element of interest in the diagram and then zoom into that section. The Pan and Zoom window will allow you to do this for any size diagram with tools for panning and zooming which are particularly useful during workshops or focus groups. 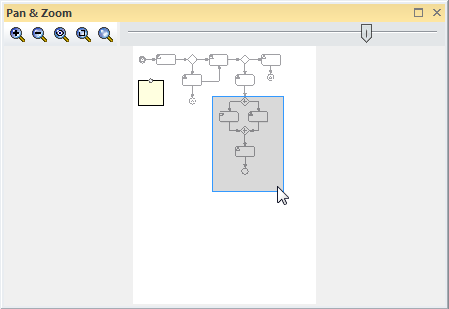 The Pan and Zoom window can be used for moving around and zooming into large diagrams. A typical scenario could be that an Analyst has created a diagram showing traceability from Solution Components back through detailed Requirements and User Stories and Processes up to the level of Business Goals. This diagram would typically be too large to view at the right resolution even on a large monitor. The Pan and Zoom window could be used to set the diagram resolution to a scale that could be easily read and then to pan around the diagram to elements and areas of interest, zooming in and out as required. Panning can be achieved by using your mouse pointer to drag the colored rectangle around to pan to different sections of the diagram.